Follow these 9 must-haves before deciding on the right eCommerce personalization solution for your business. Successful eCommerce brands know that there is no better way to make an online customer feel special than through personalization. This understanding is not limited to luxury brand marketers—most online merchandisers try to make their web visitors feel like royalty, and it works. When a customer feels a connection to a brand, sales and loyalty both increase. Personalization can energize an existing customer base and increase profitability far more efficiently than trying to acquire new customers. Almost 90% of consumers say that they are influenced by eCommerce personalization, and almost 90% of marketers say that eCommerce personalization has boosted revenues (source). Real-time personalization obviously offers plenty of benefits. 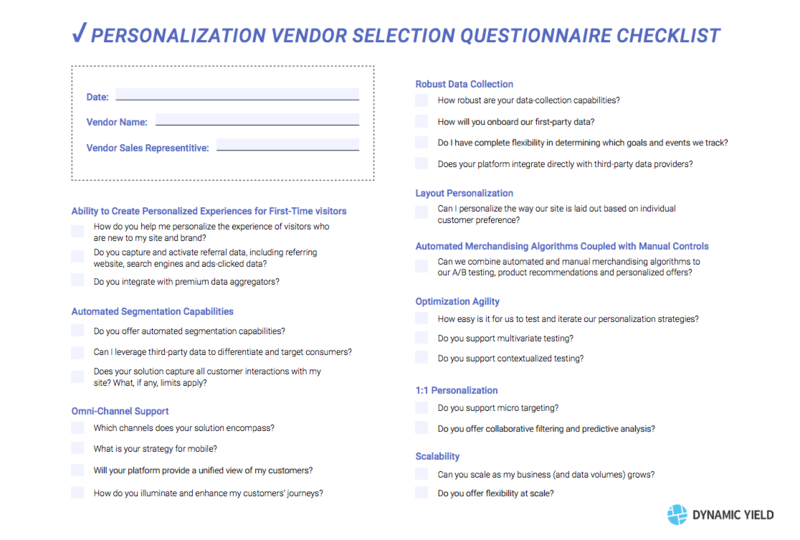 Bonus: Download a free personalization vendor selection checklist here. Data issues – limited data on new customers and an overwhelming amount of data for established customers. Results must be available fast – but must still be high quality. The system must respond to new input in real time. Effective personalization is mathematically complex – Determining statistical significance for personalized product recommendations is a huge mathematical challenge. Legacy CMS and back office systems – represent a major roadblock for some businesses. Download our free ebook and discover everything you need to know when selecting an eCommerce personalization vendor that can deliver on your goals. Software that facilitates website personalization for a first-time visitor to a site can partially compensate for the not-enough-data problem that new customers represent. The referring website is often a big clue as to the preferences of a first-time visitor. Third-party data from data aggregators can be used to round out the picture and help provide a new visitor with a welcoming experience. A business that wants to target specific segments needs to think about what segments need to be defined and how to best appeal to those segments. Automated segment discovery tools are available that help identify segments and their attributes. In an omnichannel world, any personalization solution should be able to target the complete customer journey, across devices and channels. Desktop-only personalization ignores the ever-growing importance of mobile devices. The personalization system needs to be integrated in such a way that the brand has a unified view of its customer and can analyze customer behavior, irrespective of the channels it is active on. The customer also needs a unified and seamless experience when it accesses the site through different devices. A business needs to consider what kind of data is going to be most useful. What we think of first when we think of personalization is probably historical customer data. Third-party data can be just as valuable, however. ZIP codes, weather, and relational geography can be tremendously important. Shipping policies tailored for the shoppers’ specific location provides transparency while making shoppers feel welcome. The ability to reconstruct site layout and structure, tailored for individual preferences, is one of the fundamental requirements of quality eCommerce personalization. What the shopper sees on each page should be based on cumulative knowledge about the shopper and the new information presented by current behavior; in other words, layout personalization should ideally serve the current needs of the shopper while taking into consideration historical preferences. An ideal eCommerce solution should have the ability to utilize both manual and automated algorithmic decisions. A/B testing‚ product recommendations, personalized offers – can all be done effectively when there is a great deal of flexibility in determining the strategy. Merchandisers should be able to utilize their vast knowledge through manual control, while automated algorithms can optimize marketing campaigns at scale. An agile approach brings as much value to an eCommerce project as it does to any other project. Possibly more. Building a really effective eCommerce site involves a lot of testing and experimentation. No assumptions should be made and the site should be flexible enough to adjust as data is interpreted. Personalized eCommerce translates into constantly adjusting customers’ eCommerce journeys as brands learn more about their customers and how to give them what they really want. eCommerce personalization solutions needs to allow brands to isolate individual customer behaviors in as much detail as needed. The more brands can micro target their audience, the more they can shape offerings to appeal to niche segments of their customer base. The ideal – though difficult to achieve – is one-on-one targeting, a software solution that can see customers as well-rounded individuals. Scalability is critical. A good eCommerce needs to allow a business to take advantage of growing customer experience. The ideal personalization and optimization solution should enable brands to present their content in whatever manner is going to be visually appealing to their target audience. eCommerce personalization increases sales, customer engagement, and customer loyalty. 45% of consumers say they are more likely to shop on an eCommerce site that offers personalization. Setting up a truly effective personalized eCommerce site may be seen as a complex proposition involving lots of moving parts, but with the right set of tools at hand, it is much easier to achieve. 45% of consumers say they are more likely to shop on an eCommerce site that offers personalization. Overall, eCommerce personalization is simply the only way to stay competitive in today’s fast-paced eCommerce environment, and luckily, it is always possible to start small.